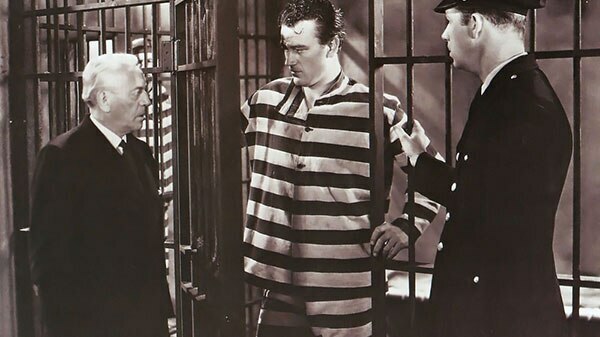 Oscar Winner John Wayne stars as an undercover government agent in this classic 1935 western of greed, gold and danger. The wild frontier town of RAINBOW VALLEY desperately needs a road, and Special Agent John Martin (Wayne) is assigned to protect the men who are building it. The construction project is constantly being stalled by Rogers (LeRoy Mason), a prominent citizen and Martin’s rival for the affections of local postmistress Eleanor (Lucile Browne). Rogers secretly wants the gold-rich land for himself, and he dupes the governor into paroling hired gun Butch Galt (Jay Wilsey), who recognizes Martin as his former cellmate. Believing that the covert lawman is in league with Rogers and his gang of bandits, Galt gives Martin stolen dynamite to hide—to permanently disrupt the roadwork. But with the help of old timer mailman George Hale (George “Gabby” Hayes), Martin instead uses the explosives to complete the highway and puts an end to Rogers’ nefarious plans.